This is a comradely invitation to my following I.P.T. Training Workshop given in the installations of Hospital Angeles in Tijuana, the following 24, 25 and 26 of April 2014. Training and certification is given by the Senior I.P.T.®- I.P.T.L.D.® Instructor: Donato Pérez García, M.D.At the end of your training you’ll be receiving an official I.P.T. Certification Letter and Official I.P.T. Physician Credential, with and approved seal from the teaching institute, Hospital Angeles and signed by Donato Pérez García, M.D. 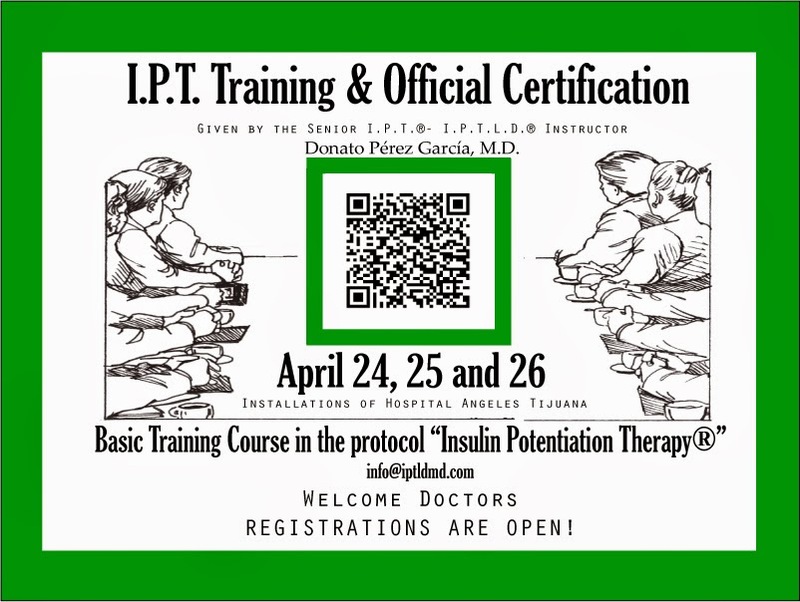 April 25th: Insulin & applied cases of Insulin Potentiation Therapy®. April 26th: Learning the method of I.P.T®-I.P.T.L.D®: Step by step training. A personal letter requesting training in “Insulin Potentiation Therapy”. d) Once approved, you can make your payments via PayPal (the earlier you register, the more discount you’ll receive).